This weeks Listography is a lovely one, head over to Kate Takes 5 to read the others too. Today we are are asked to share out Top 5 wishes for our child. 1. Happiness - Joseph's start was a sad one, it was scary, highly medicalised, and not very nice. It was a happy time of course, we had a son, but his life was in the balance. All my hopes and dreams were consolidated to one though, I want my son to be happy. So Joseph I wish for you happiness. 2. Health - When Joseph was born someone handed him a list of premature baby complications and he worked his way through each one in turn. He had sepsis, anemia, a PDA (hole in the heart), high blood sugar, ya da ya da. We were told that his first few years would be marked by hospital admissions and ill health. Joseph is a very healthy little man. Joseph I wish for you continued good health. 3. Humour - Life is serious enough, and I think it helps if you can laugh. Joseph already has mastered the art of the quick comeback. A few weeks ago I couldn't find him. He was in the spare room. I walked in and he was covered in lipstick, mascara and eyeliner. I was ready to shout and he said "don't be cross mummy it's daddy's make up". Joseph I wish for you humour in all that life may throw at you. 4. Resilience - Sometimes life knocks us for six. Everything is going just fine and suddenly your world turns upside down. The difference between people succeeding and failing is "bouncebackability". Joseph has already shown this. 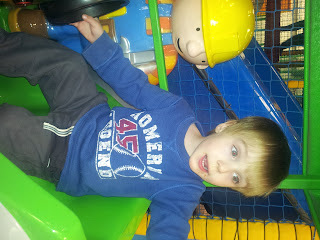 I remember at several points in hospital when doctors thought we might have a sad outcome, Joseph would bounce back. Joseph, I wish for you that you remain a bright, resilient spirit. 5. Music - At many times in both my life and my husband's music has taken on a great importance. We both love listening to desert island discs and pretending to choose our own. I had the great pleasure of learning the violin and playing in the Tasmanian Youth Orchestra. I was seriously crap but I loved it. Playing and listening to music has made me very happy. Joseph, I wish that your life be full of music. If music be the food of love, play on....play on. I laughed out loud at Daddy's makeup - well done cheeky boy!!! That's a really really good list. But really happiness is everything isn't it? Lovely wishes for your son! I hope they all come true for him.